This interesting display Bowie by Maxam Knives of Dallas, Texas, was created as a canvas for the hand painted wolf themed artwork on the blade. The knife itself still has a limited lifetime warranty, but wasn't intended as anything other than a piece of modern folk art. It's a smaller version of a craft popular in recent years, painting folk scenes on old saw blades. The 12 1/2" wolf knife has the crude and heavy look of a frontiersman's Bowie. The old knives were built to be functional rather than pretty, and hard use sometimes made on the spot repairs a necessity, so it isn't out of line to show such a blade with a crude antler handle. People used what they had, and this would be available to any mountain man who had to put things together on the trail. 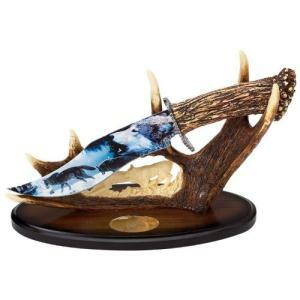 This isn't real antler, either in the handle or in the display rack. The artist knew enough about the subject to recreate them both in reasonable detail, even adding a wolf sculpture to the rack itself. Knife decoration usually doesn't extend past the handle--painting the blade would indicate that this knife wasn't built for anything but a desk. It isn't likely to be tested, because any use at all will mar the painting. The warranty does not extend to the artwork.